We’d love your help. 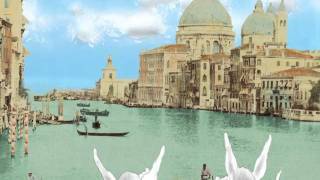 Let us know what’s wrong with this preview of Olivia Goes to Venice by Ian Falconer. To ask other readers questions about Olivia Goes to Venice, please sign up. look at all of my olivias!! the one in the middle who looks all dirty actually is very dirty, because she is supposed to be wearing red footie pajamas, but they keep falling off because she is a little nudist. anyway, look at that signature! !awesome ariel lied to ian falconer and told him i was a five-year-old girl (which makes me feel better because no girl my age should have this many stuffed olivias, and we haven't even photographed the olivia music box, the olivia alarm clock, the olivia bath toys, he olivia charm bracelet etc...) so he signed it both as himself ian falconer and as olivia the best pig ever.apparently he only signs as himself for adults. this lie was necessary. i have been told by more than one person that i share many attributes with olivia. i interpret this as a statement that i have a lot of enthusiasm, and a wide range of ideas and opinions. i am told that in fact, i am bossy and loud and adorable. i'll take what i can get - at least one of them is a compliment. when i was in florence, i was the same way, w/r/t the gelato. i was an unstoppable gelato-eating machine. in venice, i ate zero gelato, but i displayed my olivia-ness by loudly questioning why everything was closed by 8. and why there was a mcdonalds. and why the bathrooms were just holes in the floor and how was i supposed to remove that much clothing when it was so freezing and aim myself gracefully. i am a lot of fun to travel with, believe me. 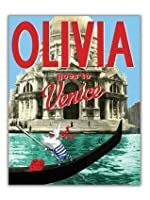 while this book is an olivia book, and therefore perfect, i will say that i like the inclusion of all the photographs of venice less than the more usual style of falconer's books. it was a little more glossy and slick than i like in an olivia book. but the story is charming and it is a great xmas present and ariel is pretty awesome, i think. After reading this I think I need some gelato. RTC. Saturday we went back-to-school shopping which meant clothes, new lunch bags, and a visit to a bookstore. My beloved MIL was with us, and as we walked by a display of picture books she said something about missing that, now that the girls are so grown up. "I bring home picture books every time I go to the library" I said, "I read aloud to Tash just yesterday." This is what I read aloud. We both really liked the joke about Olivia and the TSA. We sighed over the pictures, we liked the running gelato gag. But there's a lot less of Olivia's personality in this book, and we missed that. The sites were impressive, but Olivia wasn't imagining herself living in it, so it remains just pretty pictures. We no longer have regularly scheduled reading time before bed, and the girls seldom check out picture books themselves, but I haven't stopped reading to them, by a long shot. Often I only read one shapter aloud to them from whatever novel they have going, or the pictures books I bring home. But it's still something. I'm glad. It is one of my favorite parenting tasks. This is a poor attempt at making Italian culture accessible to children. Although the images of Venice are eye-catching, making the illustrations creative, the story is truly horrible, in my opinion. When I read this story to my kindergarten class, their blank faces and confused interpretations of the story were all that was needed for me to lose complete respect for this book. This book is a perfect example of how publishers can exploit popular characters to make some money. I wanted to like this more, because I love Venice. It was also my first Olivia book so there were things that were jarring for me that may be typical. The really pale drawings over color photos and the humor being kind of mean and destructive was the jarring part. The frequent gelato stops were realistic, and the page with the pigeon's was vivid, if not as much of a reality now. I get such a kick from the Olivia stories. I wonder if she likes barbecued pork sandwiches? While it's always difficult to resist that perky little porker, Olivia, it's impossible now that she's visiting one of the most beautiful cities in the world - Venice. Yes, sporting a gondolier's hat with its ribbons flying she's about to take that storied spot by storm. (almost literally). As most know by now Ian Falconer has created one of the most appealing children's book characters to be found. Olivia,along with her brother, Ian, and their mother and father have shared many adventures – from forming a band to visiting a circus to preparing for Christmas. Now, they're off to Italy. It's spring vacation and Olivia wants to take along her snorkel, flippers and water skis lest the city is under water – mother prevails. Happy to hear that she'll find pizza and ice cream everywhere Olivia enjoys their overseas flight. Upon seeing the beautiful Grand Canal lined with incredible palazzos Olivia begs to live in one of the palazzos. Of course, she was disappointed when this couldn't happen but a gelato or three cheered her. They're all overwhelmed by how much there is to see – Piazza San Marco, the bevy of pigeons, the gondolas, the Rialto Bridge, the Bridge of Sighs. Everything about Venice is grandly overwhelming to Olivia and she decides she must find the perfect souvenir of their trip. Young readers will laugh and be surprised at exactly what that is.......as well as its effects upon the city. The Olivia stores simply become more delightful with each telling. Exuberant Olivia is packing her snorkel, flippers and water skis for the family trip to Venice, Italy for spring vacation. Her mother informs Olivia those items won't be needed. We go to Venice with the family, and witness Olivia's first airport search, which pleases her greatly. I enjoyed the armchair tour of Venice's famous landmarks and canals. The author did a wonderful job of including information and pictures of these to teach children about them in an Olivia book. Being a big fan of pigs I thoroughly enjoyed the drawings of Olivia and her family. Such fun detail, such as the family enjoying gelatos -- the baby's ice cream is shown as a splat on the ground, with the baby holding only a cone. Okay, I'm a glutton for punishment. I find Olivia immensely irritating, so it took me a while to get to this book. I love Venice, so the rationale was, they'd even out. Well, they did! I was actually finding the story quite charming as Olivia's family journeyed through the narrow streets and grand spaces of Venice but then Olivia does something I don't find to be funny, but rather, kind of appalling. I don't even think I'll read this to my son because he can't think that what she (and subsequent Okay, I'm a glutton for punishment. I find Olivia immensely irritating, so it took me a while to get to this book. I love Venice, so the rationale was, they'd even out. Well, they did! 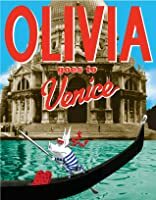 I was actually finding the story quite charming as Olivia's family journeyed through the narrow streets and grand spaces of Venice but then Olivia does something I don't find to be funny, but rather, kind of appalling. I don't even think I'll read this to my son because he can't think that what she (and subsequently her family) did was okay. The characters of the book are adorable. The book can teach readers new things about Venice. It can definitely can help children explore the different country that they have never been too. If the children have been to Venice, they can still make connection with the story. This reminded me of our trip to Italy. Fun! This is an adorable book about a pig who goes to Venice for her spring break. The Olivia books are some of my very favorite, and I used to read them to my sister all the time! With this book I would incorporate other books that show case other countries like this book does, and talk about the different settings and pictures in the books. If would be fun with a young age group of students to teach them about how other areas of the world look different from ours. Olivia and her family spend their Spring vacation in Venice, and it will never be the same after our high-energy heroine Olivia leaves her footprint. The family visits all the interesting sights, and gorges themselves on gelato, and Olivia tries to find the perfect memento to take back home to remember her visit. The Olivia books are always fun to read! Olivia gets to go to Venice, Italy with her family and she describes her time there. This is a cute, fun book that I think younger students will enjoy! I also liked how the illustrator used actual pictures of Venice, Italy. This just makes me want to go back to Venice. Such a fun book. Nos encanto a mi bb y a mi. Un lugar hermoso descrito en un libro para pequeñitos. Cute. Olivia visits Venice and sees beautiful buildings and canals. And eats a lot of gelato. She also learns a good lesson about taking things as souvenirs. My daughter's absolute favorite! Inspired her third birthday party! Really love the combination of the hand drawn illustrations with actual pictures from Venice. 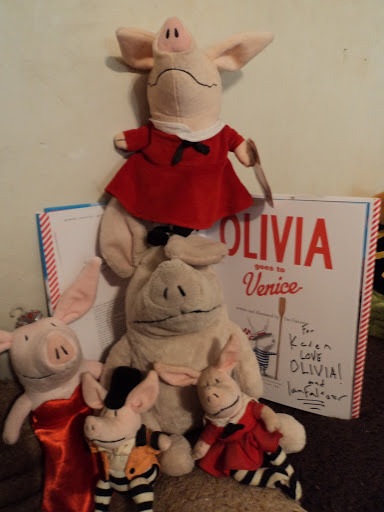 My toddlers love the Olivia books. We like the layer of adult humor sprinkled in that makes the endless re-reading more bearable. This is my husband’s favorite in the series so far. Another fun (and very destructive) adventure with Olivia. Cute. Gotta love the precocious Olivia.